The Nintendo Switch was revealed a few weeks ago, and the response to it has been impressive, with its launch video racking up over 18 million views on YouTube in a week and completely overshadowing Rockstar's own reveal of Red Dead Redemption 2. But even with all the buzz around Nintendo's mysterious handheld/console hybrid, many are wondering whether or not Nintendo's going to shoot itself in the foot by once again releasing underpowered hardware. It may seem like a mistake for Nintendo to chase the same philosophy of its forbears, focusing on innovation over raw tech, but it's honestly the smartest thing Nintendo could do right now. There's no point in running a graphical arms race it has shown no real intention of winning. The more important thing for Nintendo Switch to succeed - and how it can improve upon the similarly built yet ultimately failed Wii U - is for it to be capable of delivering games that look 'good enough' while advertising how easy and simple it is to take those games with you on the go. Here's the dirty secret console manufacturers don't want to tell you: the most successful platforms each generation are often the weakest, valuing a lower price over technical performance. Look back over the history of consoles, and a pattern emerges. The Sega Genesis outsold the Super Nintendo and Neo Geo, beating Nintendo in the North American market for four consecutive holiday seasons. PlayStation demolished the Nintendo 64; same for the PlayStation 2 against the Xbox and GameCube. The Wii was a fluke, but even taking that out of the equation, the Xbox 360 outsold the PlayStation 3 for years. The PlayStation 4 is a strange beast as it's more powerful than its closest competition, but its success was - in part - because Sony was smart enough to undercut Microsoft's Kinect pack-in gamble by a hundred dollars. There are plenty of other factors at stake that can cause a system to outperform its competition - the PS2's dual functionality as a relatively inexpensive DVD player certainly helped cement its place as a must-own device for cinephiles as much as it did for video game players - but there's no denying that price and ease of use are deciding factors for a lot of people. The Wii U's problem was never that it’s underpowered. Technical limitations often provide unique opportunities to find other ways to innovate - while Sony and Microsoft fans were arguing about how many p's the PS4 or Xbox One could render, Nintendo was silently releasing absolutely gorgeous games like Super Mario 3D World, which ran at 1080p at a rock-solid 60 frames per second. The problem with the Wii U was that people were either so confused by its messaging that they ignored it completely, or wanted a Nintendo console but saw how poorly the Wii U was doing and decided to wait until the inevitable follow up. Launching in bundles of up to $349, the Wii U's expensive and cumbersome tech prevented the kinds of price drops that helped save the 3DS when it launched to a tepid sales response, inevitably dooming the Wii U to its place as a very expensive curio (and, ironically, the home of some of Nintendo's best work in years). That's (hopefully) not going to be a problem with the Switch. Nintendo has made its marketing message clear in a brief, mostly wordless sizzle reel, concisely showing off the potential of its console/handheld mash-up. This is a device that will let you play all the latest big-budget Nintendo games like The Legend of Zelda: Breath of the Wild, Splatoon, and a new Mario game on the go, along with Totally-Not-Skyrim-But-Actually-Skyrim and other potential third-party titles. That's how the Switch can succeed where the Wii U failed, and where other consoles are beginning to muddy the waters. In just a few days, Sony will launch the PS4 Pro, a sort of half-step upgrade with a more powerful graphics processor capable of outputting (some) games in (kind of) 4K resolution with HDR lighting, as well as providing enhanced visuals, if the developer chooses to take advantage of the hardware. This is where things get tricky, because the benefits of the PS4 Pro are currently a giant question mark. Which games are going to take advantage of the hardware? Which games will look and run demonstrably better on the Pro versus the smaller, cheaper iteration? Is there a reason to upgrade at all if even the less-expensive model now supports HDR lighting, thanks to a firmware patch which applies to all PS4s? All of these questions have to be answered on a case-by-case basis, because while Sony has certain requirements in place (content must be the same on both versions and arrive at a standard baseline of quality, for example), how each game takes advantage of that hardware is up to each developer. To make matters worse, 4K TVs aren't anywhere near ready for mainstream consumption, as manufacturers are still making great strides in image quality and cost reduction - and wading through that mess is a whole other topic for a different day. Nintendo Switch, comparatively, looks far easier to grasp (especially compared to the last decade of Nintendo devices). Its games may look less detailed than their PS4 and Xbox One counterparts, but its games will look 'good enough' for the general public, and will seem even more impressive once people actually see games like Breath of the Wild running on the machine. The jury's still out on whether third-parties will support the Switch beyond the initial run of launch games (I want to be hopeful, but considering the last two decades of Nintendo's history with third-parties on its consoles, I wouldn't hold my breath), but there's no doubt that Nintendo's technical wizards are going to make Mario Kart, Splatoon, and other potential titles look incredible on it. Nintendo's games won't win any awards for having the most detailed textures on-screen, but the clean, cartoony style it takes with many of its franchises look great on whatever platform they're running on - even the comparatively weak 3DS. That's not to say that graphics aren't important. People were wowed by games like God of War and Days Gone at E3 2016 - but they were also just as wowed, if not more so, by Breath of the Wild, which won E3's Game of the Show from numerous outlets (including the one you’re reading) despite running on far weaker hardware. History has shown that price and ease of use seem to be more important than raw processing power. 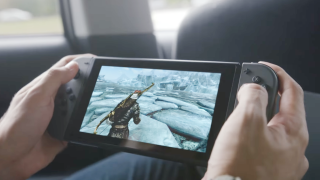 As long as the Switch arrives at decent price point, switching between console and handheld play is as easy as it looks, and its games look 'good enough', it won't matter if the Switch is as technically proficient. It'll be the only place you can get Nintendo games, and considering Splatoon sold nearly 5 million units on a console only 12 million people own, that still means a lot these days.